I'm not sure when the New Inn (shown as 'E' on the map below) first opened its doors as the name 'New Inn' was frequently applied to a former inn on the site that had been rebuilt after some disaster or other, such as a fire. It is highly probable that such a previous inn was on the site because of its prime town centre location. In this case, however, it may have been that the old inn fronted onto Middle Street but was demolished when Bond Street was laid out and constructed around 1830-35 by Peter Daniell, probably by the Crewkerne United Breweries Co. Ltd (whose name is seen inscribed on the building in the first photograph below). This would fit in with the building's architectural style of the 1840's, again as seen in the first photograph. The earliest mention of the New Inn I have found is in Slater’s Directory of 1852 (referring to coaches from Cerne Abbas) “To YEOVIL the South Western calls at the New Inn every evening at half past five” but I haven't found any licensees this early. The New Inn occupied the corner site where Bond Street joins Middle Street but originally it only occupied just over half of the building as it fronted Middle Street (that part with double windows above) while the lesser part was occupied by a shop. The shop was later incorporated into the New Inn as seen in the third photograph below. This was one of only three beerhouses listed in Whitby's 1882 Yeovil Almanack Advertiser. However, as seen in the later photographs, the building has undergone considerable external cosmetic modifications and, of course, complete internal changes in its present guise as a branch of the Nationwide Building Society. 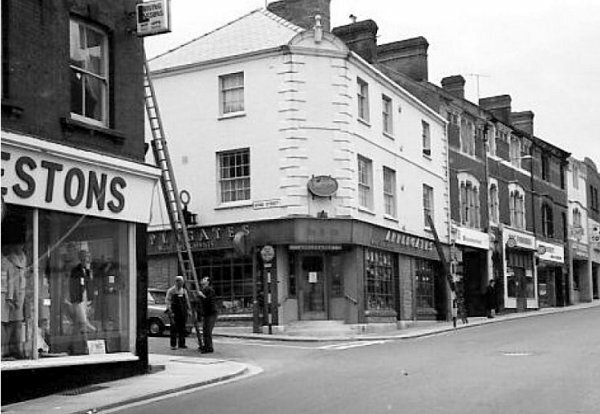 In the 1960's had a brief spell as Appleton's Wine & Spirits shop (fourth photo below) by which time the ornate surround to the entrance had disappeared along with the first Bond Street window. In the 1970's it re-opened as a public house named the Flying Machine - which is how I remember it although I always thought it was a little austere inside. 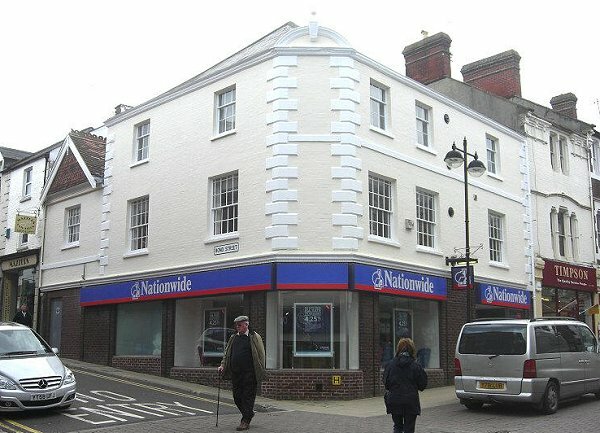 Now, of course, it is a branch of the Nationwide Building Society and has completely lost its character at ground floor level as well as losing its corner entrance. Above, fortunately, the pleasing proportions of the fenestration and stonework detailing of the building remain unscathed. The first documented license was John Lydiatt who was born in Kineton, Warwickshire about 1814 but I first encountered him in the 1871 census in which he was listed as a glazier and innkeeper in Middle Street. He was aged 57 and his wife, Elizabeth, was 44 and born in Hardington Mandeville. Their two children, Susan and Albert, were living with them. John was listed as a beer retailer in Kelly's 1872 Directory but he died in the spring of 1874. Elizabeth then took on the license and was listed as beer retailer in Kelly's Directory of 1875 and Whitby's 1882 Yeovil Almanack Advertiser in which she was listed as licensee at '98 Middle Street (the New Inn)' although in the 1881 census Elizabeth was actually listed as a shopkeeper at 48 South Street. By 1901 Elizabeth was living as a dressmaker in Mortlake, Surrey, with her shopkeeper son Albert and his family. In 1911 she was living with her widowed daughter Susan and her children in Tolworth, Surrey. George Henry Childs (sometimes known as George, sometimes as Henry). He was born around 1847 and both he and his wife, Susan, came from Corscombe, Dorset. George was the son of agricultural labourer Philip Childs and his wife, Sophia née Sartin. By the age of 14, in 1861, George was an agricultural labourer like his father and older brother. In 1871 he and his older brother Stephen were living in Corscombe with their 73-year old pauper grandmother Elizabeth Childs. In the 1881 census George, by now aged 33 and married to Susan (they married in June 1880 in Beaminster, Dorset), was listed as the publican of the New Inn. By the time of the following census in 1891 George and Susan had three children; Robert, George and Sarah, and had moved to the South Western Arms where George was listed as the publican. Kelly's Directory still listed him as the licensee in 1895. By 1901 George had moved his family to 59 Reckleford where he was working as a general haulier; Robert was a wheelwright, George jnr a blacksmith and Sarah was a dressmaker. It was not possible to determine which John Goss was the next licensee. Frederick Hambridge was born about 1868 in the United States of America. He was the son of Yeovil general dealer Henry Hambridge and his wife, Caroline née Ricks, also from Yeovil. Henry and Caroline had emigrated to America after they married and lived in New York, where they had at least five children, and then moved to St Louis where another child was born. By the time of the 1881 census the whole family had returned to Yeovil and were living in Vicarage Street. In the 1891 census Frederick was living on his own in the New Inn, which was listed as a wine stores. He was aged 23 and single although he was not to stay long because in that same year he went back to America. He married Anna, a native of Berlin, Germany, and the couple lived out the rest of their lives in Buffalo, New York. John Dunn was born in Preston Plucknett, Yeovil, around 1835. He married Mary Ann in 1874 - he was 39, she was 19 - and they went on to have five daughters; Louisa, Edith, Agnes, Margaret and Clara. In the 1881 census John was visiting in Nottingham but in the 1891 census he was living with his family at 59 South Street, Yeovil, giving his occupation as gardener. By 1901 he was listed as publican of the New Inn and the census lists him with Mary and the four younger girls. John died in the autumn of 1901, aged about 66. Mary briefly took on the license of the New Inn for a couple of years and was listed as licensee in Whitby's 1903 Yeovil Almanack Advertiser but had moved on by 1907. I couldn't trace either of the next two licensees, R King and Frank Hurlstone. Harry Leversha was born in 1870 at Stogursey, Somerset, the son of Esau Leversha, a thatcher, and his dressmaker wife, Anne. In the 1871 census Esau, Anne, their three daughters, baby Harry and his older brother were living in Shurton, Stogursey. A decade later, however, Harry and his family were living in the Stogursey Poor House. By 1891 Harry was living in Taunton with his older sister and her family. Both 21-year old Harry and his brother-in-law, Thomas Cross, were bakers. Harry married in 1893 and he and his Yeovil-born wife, Annie Mary, settled in Taunton although I couldn't trace them in the 1901 census, but by 1907 Harry was licensee of the Swan Inn in Park Street and was listed in the Yeovil Directory of that year. 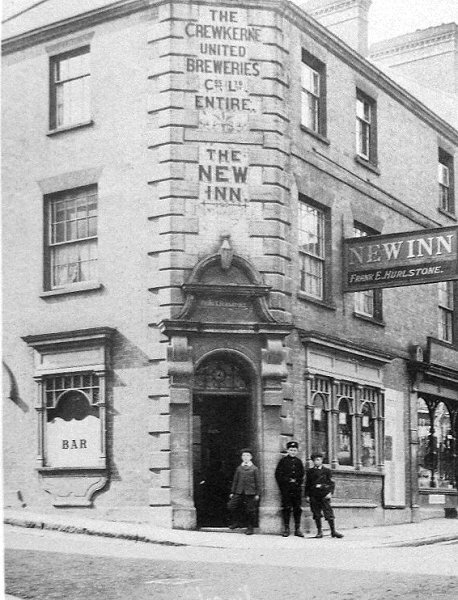 By 1911 Harry was licensee of the New Inn in Middle Street which he ran until at least 1923. This photograph dates to 1909 and shows the detailing around and above the corner entrance (compare with the last photograph below) as well as above the ground floor windows. I expect that Crewkerne United Breweries Co. Ltd. actually built the premises as well as supplying it. This photograph, taken around 1905, looks along Bond Street as seen from Middle Street. The ornate arched entrance at right is the side entrance to the New Inn in what appears to be a building erected separately with its gabled roof facing the road. This is seen more clearly in the last photograph although the decorative arch over the side entrance has gone and the entrance itself reduced to just a nondescript security door. 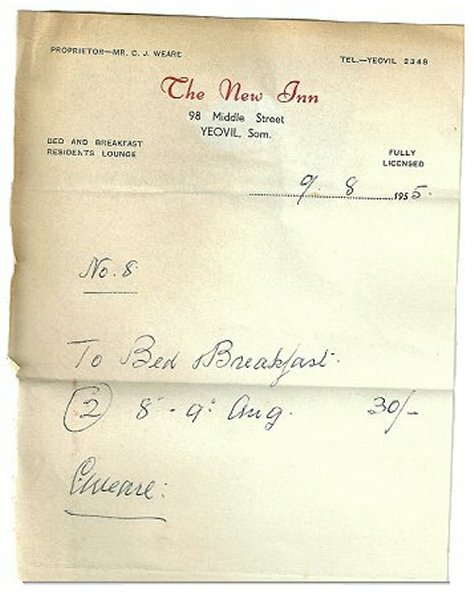 A 1955 bill for B&B for two at the New Inn. 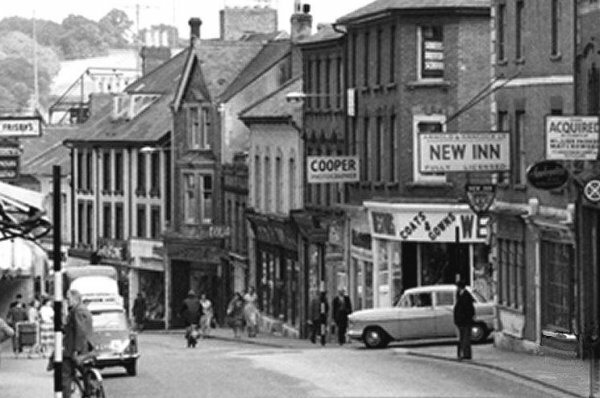 This photograph was taken during the early 1960's and looks down Middle Street. 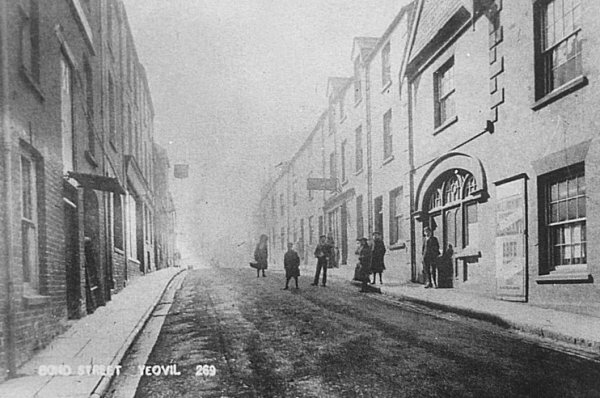 The New Inn is seen at right, with the car just entering Middle Street from Bond Street. Another 1960's photograph with the building now occupied by Appleton's Wine & Spirits shop. Note the wraparound shop front with new windows and a nasty signage fascia - the architectural integrity of the building is well on its way out. 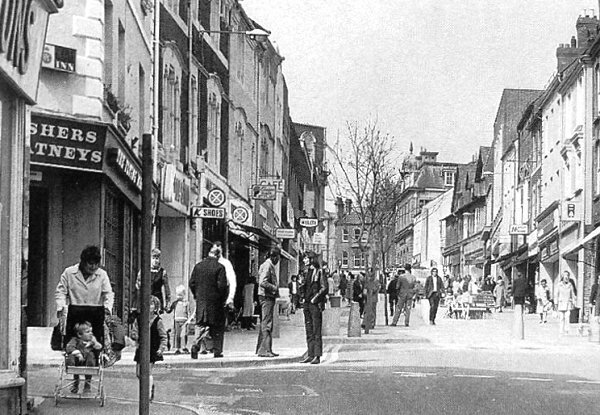 A photograph dating to about 1975 of the newly-pedestrianised Middle Street with the New Inn in its guise as the Flying Machine on the corner of Bond Street at left. Note the 1970's Ushers and Watneys signage, so typical of the period. 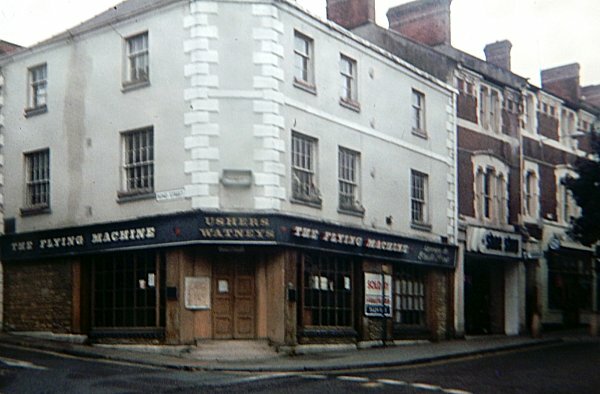 The Flying Machine, closed and for sale in the late 1970s or early 1980s. Last photograph, taken in 2012, shows what a fine building it is above the ground floor travesty of large (and largely unnecessary) plate glass windows and the gaudy and incongruous signage fascia. Note too the absence of the corner entrance.